In the news today is a troubling story concerning the sacred turtle of Vietnam’s Hoan Kien Lake. This rare and endangered turtle is sick and slowly dying from pollution. 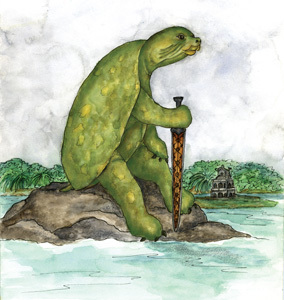 The following story from our Squidoo Lens, The Mysterious Creatures of Cryptozoology is about the legend of Kim Qui and some information on the turtle itself. Hoan Kiem Lake is located just west of the Song Hong River (“Red River”) in an urban setting near Hanoi’s Old Quarter and about a mile southeast of Truc Bach Lake, where John McCain landed after being shot down by a North Vietnamese anti-aircraft missile in 1967. In the middle of Hoan Kiem Lake, there is a small island with a structure known as The Tortoise Tower that commemorates the Kim Qui legend. In scientific terms, Kim Qui is a Yangtze giant soft-shell turtle, which is formally known as Rafetus swinhoei. Weighing in at around 400 pounds, it may be the largest fresh water turtle in the world. It is easily identified by its pig-like snout and nostrils.